White paper on crime 2004 Part5/Chapter3/Section3/5. As mentioned in Section2-3 in this chapter,prisons have developed the treatment of Class F prisoners following their cultures and lifestyles,but their treatment puts various difficulties and burden on prison management.It is also difficult to ensure those foreign nationals who do not understand the Japanese language correctly understand the significance of imprisonment to reform and reintegrate themselves into Japanese society.Moreover,most Class F prisoners are deported after release. Therefore,the System for International Transfer of Sentenced Persons has been adopted as a new measure for foreign national prisoners,most of which are Class F prisoners.It aims at removing the difficulties in prison lives caused by differences in languages and lifestyles and lack of contact with their families and at promoting their successful rehabilitation into their society. The System for International Transfer of Sentenced Persons is transferring prisoners to their home countries and executing their sentence there to make them reform and rehabilitate into society more smoothly.In Japan, transfer in and transfer out are implemented under the Convention on the Transfer of Sentenced Persons(Law No.1of2003)adopted by the Council of Europe,and the Law on Transnational Transfer of Sentenced Persons(Law No.66 of 2002)etc. "Transfer in"is to transfer Japanese nationals serving sentences in state parties back to Japan to serve in Japanese prisons,while"transfer out"is to transfer foreign nationals who are serving sentences in Japan to their home countries(state parties)to serve their sentences there.Those transferred have the opportunity to receive correctional treatment in their home countries in their native culture and social environment. Transfer of a prisoner requires the consent of both countries concerned,and the Minister of Justice is to make a decision on whether or not to transfer a prisoner beforehand.In case of transfer out,the Minister has to make a decision on adequacy of the transfer considering comprehensively not only the possibilities of the prisoner's reform and rehabilitation,but also the retributive functions and deterrent effects of punishment rendered by a Japan's court.Transfer also requires the consent of the said prisoner. As of September1,2004,55countries have signed the Convention on the Transfer of Sentenced Persons(42member countries of the Council of Europe and13nonmember countries such as the U.S.,Canada,and Japan,excluding countries where the Convention has not become effective).Japan can transfer sentenced prisoners with these countries. The number of foreign convicted prisoners as of the end of May2004was4,593(among which3,335are visiting foreigners),and Table 5-3-3-8 shows the breakdown by nationality etc.A total of203persons(4.4%)had nationalities of the state parties of the Convention,and108persons out of them applied for transfers to their home countries etc. Only one case of prisoner transfer out was implemented in Japan,a prisoner with British nationality,during the one-year from June1,2003,when the Convention came into effect,to May31,2004. 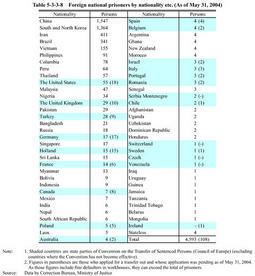 As mentioned in Section2-3 of this chapter,nearly80%of Class F prisoners are from Asian countries,and in particular,40%or50%are Chinese nationals(see Table 5-3-2-23 ).However,those countries have not joined the Convention,and prisoners that can be transferred are limited for the time being.In order to carry out the transfer out of more prisoners,Japan needs to conclude bilateral conventions on the transfer of sentenced persons with Asian countries including China,or needs to urge them to join the Convention. As a part of crime-fighting measures through promoting cooperation with foreign related agencies,the Action Plan to Establish a Society Strong on Crime, which was adopted by the Ministerial Meeting Concerning Measures against Crime in December2003,provides that,"In order to open the way to send back Chinese national prisoners,who are a part of the causes of present prison overcrowding,discussions should start between Japan and China to conclude an international agreement for the transfer of sentenced persons when preparations are completed for an international agreement on consular relations to be concluded between the two countries.Discussions should also be held about the accession of China to the Convention on the Transfer of Sentenced Persons. "The Ministry of Justice has been examining and studying the system for transfer of sentenced persons and the overall criminal justice administration in China,in order to achieve successful results.